Most mornings involve a cup of home-roasted coffeewith a bit of sugar and some goat milk and a steaming hot bowl of oatmeal that’s been cooked in goat milk. It’s creamy and doesn’t need much brown sugar. A touch of cinnamon makes it even better. On the weekends we always do at least one morning differently. While I love the oatmeal, it does get repetitive after awhile and I do like a change. Those mornings we sometimes make pancakes or waffles. When I’m feeling extra industrious I’ll make bagels or English muffins for eggs benedict. If we have bacon or sausage in the fridge we make biscuits and gravy. Sometimes I don’t have as much time or energy though so I go with something a bit easier. Scones fit this bill. Unlike bagels and English muffins, they don’t have to rise. Scones traditionally have a lot of butter, which is a treasured commodity for us so I didn’t really want to give up a stick for one breakfast. Cooked pumpkin, or winter squash is a good substitute for oils like butter. It’s also a good way to make a substitute if you want to eat a bit healthier. We have plenty of winter squash that we really need to use up so I went out to our storage area and grabbed a small one to bake. I simply cut the squash in half and scooped out the seeds. I put the squash cut face down in a baking dish and put a thin layer of water on the bottom. I put it in a 400 deg F oven until the squash was fork tender. The time will vary depending on the size and type of the squash. 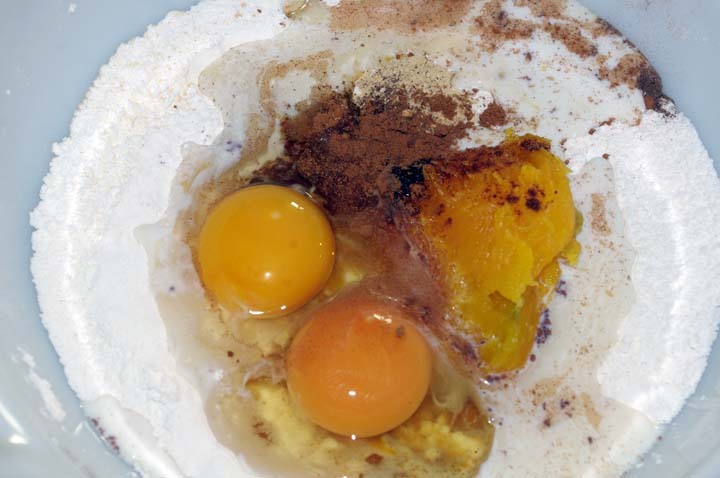 In a circular motion blend the wet ingredients into the dry ingredients with a fork. If it gets too tough to mix you can use your hands to combine. The dough should be pliable. I use medium eggs so if you’re using large eggs you’ll end up with a wetter dough. 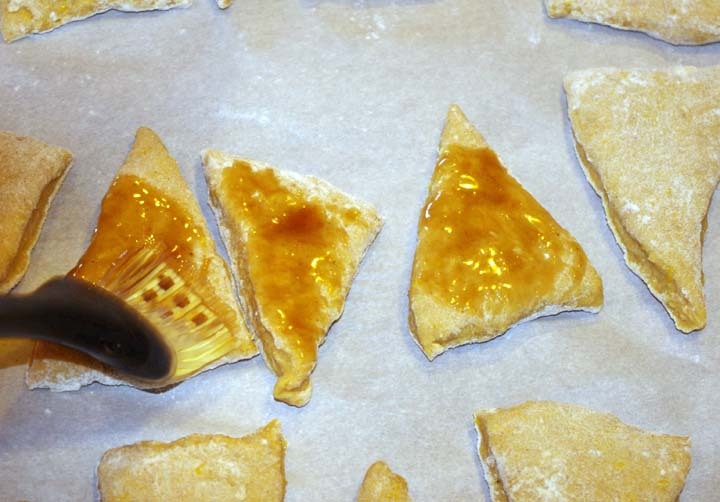 Add a bit more flour if the dough is sticky. I decided to make small scones so I divided the dough in half. Pat the dough into a ball and then on a well floured surface roll it out to 3/4″ thick. 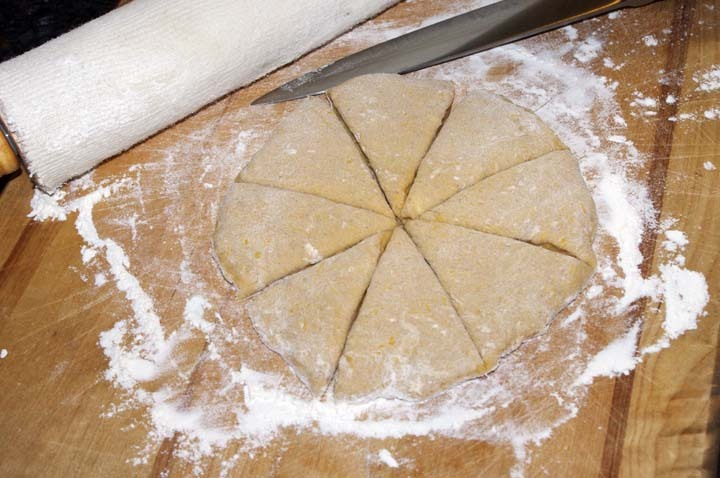 You’ll want it to be circular to make it easier to cut evenly shaped scones. One disc should make 8 scones. Place them on a parchment lined cookie sheet and brush them with maple syrup. Bake for 15 minutes or until lightly browned. These won’t have the crumbly texture or be as dense as you’re used to scones having probably because of the lack of butter. 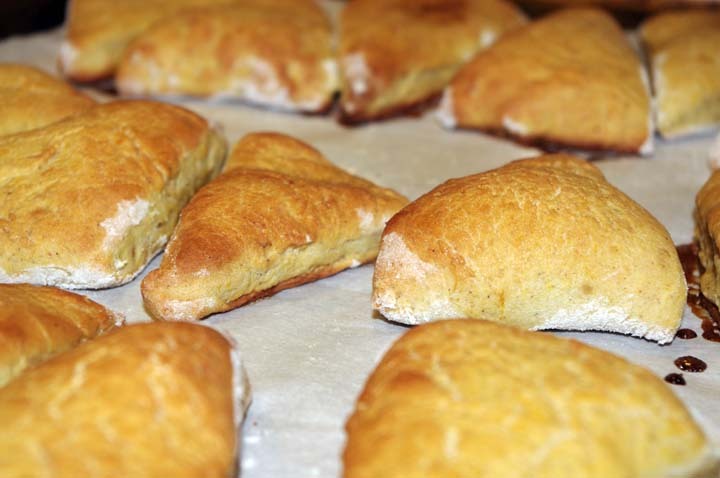 They are chewy and filling though and taste great plain or with just a bit of butter.